Working with businesses throughout the Yorkshire region, we’re dedicated to providing safe, secure and environmentally friendly document disposal services. Whether you’re a solicitor in Leeds, or a doctor’s surgery in Huddersfield, we’ve worked with companies and private firms across Yorkshire, helping them to securely dispose of private and confidential files. It is quite often the case that our clients will want to safely dispose of their documents once that they have been scanned and stored digitally. This option is great for clients who no longer wish to make use of physical documents, which can often take up large swathes of space within offices and buildings. By partnering with two prominent Yorkshire shredding companies, Go Shred and Russell Richardson, we can provide shredding and document disposal services to businesses throughout the region with secure shredding facilities. Whether you’re looking to dispose of papers, documents, files, or photographs, everything shredded by Microform also undergoes a compaction process, meaning that information retention is impossible. Once that the documents have been compacted, they are then sent for recycling at nearby facilities. What are the advantages of shredding and secure document disposal? 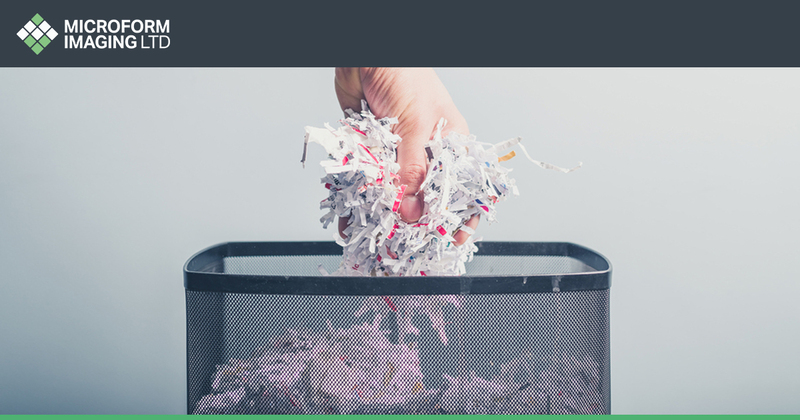 When it comes to document disposal, one of the primary benefits that a company can gain from shredding is a greater and more robust level of security, which it can then bestow on both customers and clients. Not only can Microform’s document shredding services help prevent the identity theft of clients, customers, and or patients, but employees are also afforded an extra element of security. At Microform we work with highly sensitive and private documents every day, and enforce the tightest possible levels of security for both physical and digital documents. This is why companies throughout Yorkshire, from law firms through to companies working in finance, trust Microform to shred and dispose of some of their most sensitive documents. What kind of documents can undergo shredding? No matter what kind of documents you need shredding, we can provide you with a secure disposal service to documents and papers. Once that scanning is complete, if a company or organisation chooses to have all or part of their documents returned, this can be swiftly organised and arranged. Of course, not every client wants to keep their scanned documents, but they might not want to necessarily want to destroy them either. If this happens to be the case, Microform has partnered with Deepstore, one of the most secure storage facilities in the UK. Deepstore has a range of prestigious and well-known clients, including The Royal Society and The National Archives, and provides bespoke and comprehensive underground storage facilities. If you have any questions about document shredding or offsite storage, check out our contact page, or call us directly on 01924 825 700. Previous Article What are the benefits of document scanning for SMEs?